Today we celebrate the Feast of the Chair of St. Peter the apostle. The Lord said to Peter, “You are Peter and upon this rock I will build my Church” Matthew 16:18, and “Whatever you bind on earth shall be bound in heaven; and whatever you loose on earth shall be loosed in heaven” Matthew 16:19. St. Peter’s life is so important to the Church that he has more than one feast day during the year. Today’s feast is another way the Church celebrates this. The chair of St. Peter is a symbol of authority, as Jesus refers to this in Matthew 23: 2, when he commands and warns the crowd and his disciples, “The Scribes and Pharisees have taken their seat on the chair of Moses”. The “chair” is metaphorically referring to the teaching and judging office that Moses held in the Name of God. The name that Jesus gives to Peter is a second metaphor for an office of teaching and judging, and to drive the point home, Jesus uses a third metaphor by speaking of the “Keys of the kingdom of Heaven” Mathew 16:19. The “power of the keys” is used in many ways; some are specific to the Office of St. Peter the Papacy, others are shared with those ordained to priestly ministry, the Sacrament of Confession. During this season of Lent, we pray for these human leaders of the Church chosen by God, so they are faithful ministers of God’s grace to us. This feast day is an anniversary and celebration of the “authority” of the Papacy, and the particular mission entrusted to St. Peter by Jesus. The Roman Missal explains, the symbol of the chair, and emphasizes the mission of teacher and pastor of Christ conferred upon Peter, to whom He formed in His person and in St. Peter’s successors, a visible foundation of unity of the Church. 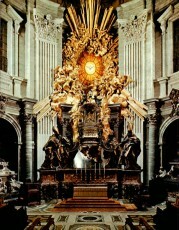 The chair, literally is a fixed seat of the supreme Pontiff and the Bishops, permanently placed in the Mother Church of the Diocese – Cathedral, and is the symbol of the Bishop and his ordinary magisterium in the local church. The Chair of St. Peter indicates his position in the Apostolic College, established by the express will of Jesus, who assigned the task of “feeding” the flock, to lead the People of god, the Church.